It is the evening of January 11, 2013, and I am on the second floor of The Arts Center in downtown Jamestown, North Dakota. In the past couple days the Weather Channel and regional meteorologists have been psychologically preparing the public for the first intense blizzard of the year. The Weather Channel has subsequently named this blizzard Gandolf — yes, I’m serious. Originally I intended on making the Eisenhower Interstate 94 drive from Fargo to Jamestown after an NDSU departmental meeting concluded in the late afternoon, but eureka rattled through my brain earlier in the morning and I thought it would be better to make the drive then and there. My hope was to beat the thermometer from Fargo to Jamestown, knowing that the light rain would turn to ice as the temps dropped below 32 F. And if I didn’t make it to Jamestown, how would I be able to attend the art gallery reception for Walter Piehl on Saturday evening with Molly at The Arts Center? Yes, I needed to act. Ice forming on the windshield and radio antenna during the early stages of Gandolf the White Blizzard. The drive turned into a white-knuckled affair, a ’93 Chevrolet S-10 rear-wheel drive pickup providing joyous stress. I found that by keeping the speedometer at no more than 40mph, the rear wheels would stay secure to the pavement. During the drive, I also thought about how author Chuck Klosterman killed off several main characters (spoiler alert!) with a blizzard in Downtown Owl, this piece of fiction set in a small town in rural North Dakota in 1984. Then I thought about the book, Children’s Blizzard. Then I tried to stop thinking such thoughts, and I continued driving. Note: when driving in winter rainstorms that are turning to ice, there are two opposing thoughts that bash at each other in the brain. It goes something like this: after a driver is 30 miles into a 90 mile drive, and just after the rear wheels slip a little at 50mph (the pick up will jerk a bit), the driver considers two options: turn around and endure another 30 mile drive back, or press on and gain another 30 miles. In the long term, if the driver retreats and makes it back home, they will have logged 60 miles, which, essentially means one could have been 2/3s the way to the destination. So I pushed on. Would I end up sliding off the road and into the ditch? Stop thinking about these thoughts. I did, and I made it to my destination. My advice: don’t do this. Ever. 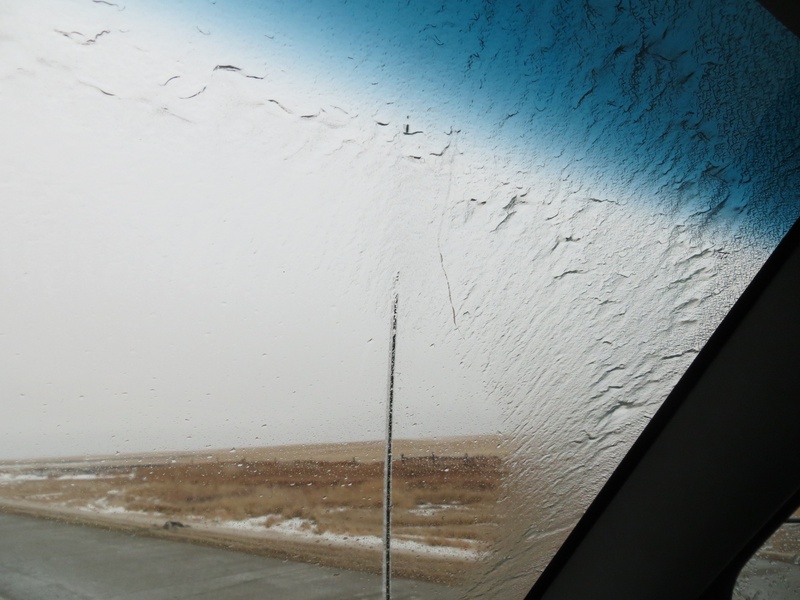 Anyhow, the photo pictured above is what the windshield looked like in the early stages of Gandolf the Grey, this between 8:30AM-to-12PM in Cass, Barnes and Stutsman counties, North Dakota. 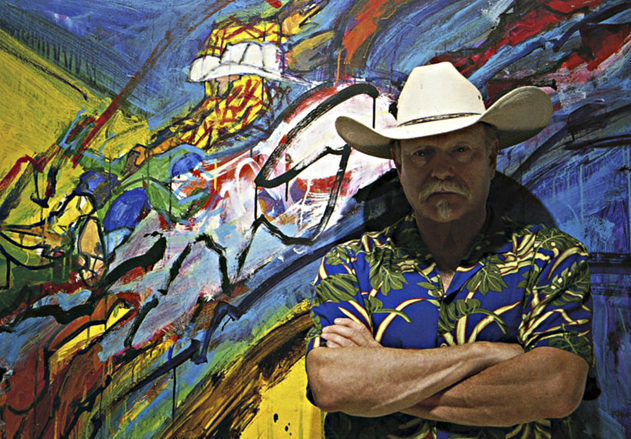 Walter Piehl and his art. The below short video clip is an intensified Gandolf, when a winter rain storm receives more training to ultimately become Gandolf the White Blizzard. As I re-visit the video over and over from a historic building in downtown Jamestown, North Dakota, I can’t help but thinking how 100 years ago an individual in the building would have heard similar sounds from this very vantage. Note, for example, the subtle chug-chug-chug in the audio, this coming from a train just a block north. The large grain elevator (not visible) is located along the tracks. Yup, 100 years ago it was possible during a winter blizzard to hear the same blasts of shivering whispers blow through the small cracks in commercial brick construction, and also hear the thump-thump-thump of the iron horse on the Northern Pacific Railroad. Historically, it is important to respect White Blizzards — lest they teach us mortality instead of just humility. This entry was posted on Friday, January 11th, 2013 at 8:50 pm	and tagged with Blizzard, Fargo, Gandolf the White Blizzard, Great Plains, Jamestown, North Dakota, Winter and posted in Uncategorized. You can follow any responses to this entry through the RSS 2.0 feed.